Abhinandan Resort is a perfect holiday destination near Mussoorie for nature lover and adventure enthusiast. Located close to the nature essence and Yamuna river, this property offers variety of experiences during the stay. 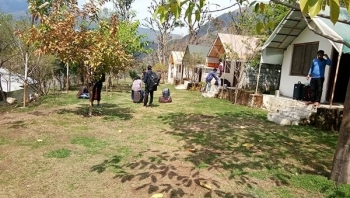 The resort provides well equipped Swiss Cottage accommodations with camping facilities as well. The resort is located on Kempty Fall road, 18 km from Mussoorie. Several tourist places in Mussoorie can be easily visit from the resort. The resort offers well appointed Swiss Cottages and a large family room having best facilities and amenities. 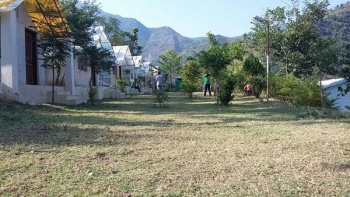 The resort also has large lawn for camping and other recreational activities. More than 100 guests can accommodate in the resort. Cottages are well furnished and has attach bathroom. The resort serves delicious veg & non veg cuisines to its guests. The mouthwatering food can be enjoyed with prompt room service. The resort is situated at 8 kms from Kempty Falls and 25 kms from Mussoorie town. One can hire taxi from Mussoorie or Kempty fall to reach the resort. Mussoorie is a famous tourist spot and connected well with metalled road. Regular buses are avalable from nearest major town Dehradun (32 kms). Nearest Railway station to reach Mussoorie is also at Dehradun and nearest domestic airport Jolly Grant Airport is located at 60 kms from the Mussoorie town.